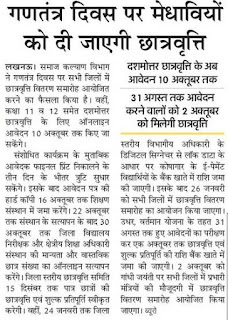 95000 Teacher Recruitment 2019 State Government is giving opportunity to B.ED Candidates who are TET Passed recently they can now apply for 95000 Teacher Upcoming vacancies in Uttar Pradesh. From 1 September joining letter distributed by CM Adityanath Yogi and Its Basic Shiksha Parishad Department. So good news of 95444 Teacher recruitment declared by One of CM attached officer and he said without telling about 95444 Recruitment in December. IndusInd Foundation Scholarship IndusInd Foundation Scholarship application form should be invited to the desirous students of Availing the IndusInd Scholarship Scheme to 12th Pass Candidates. Candidates first of all should be meritorious and application related to SHGC IndusInd Scholarship typically based on backward class economic society. There are many scholarships we have written on 12th bass but 90% Foundation prefers to give scholarship to younger students of 9th, 10th, 11th and 12th Class. RRB Group D 17th September Syllabus 2018 Railway Recruitment Board (RRB) on 31st August available the 17th September written exam date syllabus of RRB Group D. RRB included example of Model Papers on official website of Railway board. Students who are eager to know about RRB 62907 Exam Date & Its Group D ka syllabus the we remind you that RRB 17TH September syllabus is here available in link and words. Atal Bihari Vajpayee Innovation scheme has been launched For Making Indian Educational Institute to be found in World Top 100 College and University. Prime Minister Narendra Modi Led Central Government has made a panel to select those college, Institute who falls in Atal Ranking of Education Institute on Achievement. The Atal innovation scheme more details can be found below with outer cutting news in Hindi. Republic Day Scholarship 2019 Uttar Pradesh Samaj Kalyan Vibhag has decided to distribute scholarship fund on Republic Day (Gadtant Divas). UP Social welfare department said in a press meeting to further delivery of scholarship in all 75+ districts in Uttar Pradesh at 26th January Republic Day 2019. Atul Maheshwari Scholarship Last Date: - Many Students, Guardian and Principal have demanded to extend the last date of Atul Maheshwari scholarship which is now becomes 9th September 2018 (Sunday). Previous Atul Maheshwari scholarship last date was 31st August 2018 but due to huge demand and interest in Atul maheshwari scholarship, amar ujala scholarship department clears the extension of last date.